Read this article for detailed information on cyst adenomas. Ovarian cysts can be of various types and usually they are not a cause of worry as every menstruating woman creates a cyst during every normal menstrual cycle. Almost all such cysts are non-cancerous and do not spread outside the ovary, and may be felt when the pelvic examination is carried out and through the x-rays as well. Women with such non-cancerous cysts can be treated successfully by surgically extracting an ovary (unilateral oophorectomy) and also by removing the part of the ovary where the cyst (partial oophorectomy) is present. There are basically 3 types of tumors in the ovary and these are epithelial tumors, stromal cell tumors and germ cell tumors. Let us give you a brief idea about each of these three varieties. Germ cell tumors come from the cells where the egg (ova) is produced. According to the American Cancer Society, studies reveal that about 5% of cancers in the ovary are caused by this condition. These tumors have quite a few subtypes, most of them not cancer causing. Tumors in the stromal cells start at the cells of the connective tissues - this is what keeps the ovary together and makes progesterone and estrogen, the essential hormones in females. These tumors are generally found in women who are above 50, but they sometimes affect young people also. Malignant stromal tumors include granulose cell tumors, granulose - Sertoli-Leydig cell tumors and theca tumors. Epithelial tumors - they start in cells that do the purpose of covering the outer surface of the ovary. Most of these tumors are non-cancerous, and do not get spread to other body parts and generally never cause any serious illness. There are quite a few of such tumors, including Cystadenomas , which we will discuss now in a little detail. Cystadenomas fall under the category of neoplasms or new growths which grow from ovarian tissues either on the surface of the ovary or inside it. By and large, this condition affects women aged between 30 and 50. There are two types of Cystadenomas and they are Serus Cystadenoma which is filled with a watery fluid and Mucinous Cystadenoma, which is filled with a thick, sticky material. The Serus Cystadenoma tends to be smaller and reaches up to six inches in diameter, whereas the Mucinous Cysts are often bigger and can be between six to twelve inches. In rare cases, they can grow even larger, becoming as huge as 40 inches. They frequently become troublesome, pressing down on the stomach, bowels and the intestines and interfering with their normal functioning and also cause damage to the ovary. Although they are mostly non-cancerous, they have the potential to turn malignant and cause serious health complications, not only by compressing other organs, as we said before, but also by producing large amounts of hormones in an unregulated manner. Cystadenomas are diagnosed using a variety of techniques, such as through blood and urine samples, through ultrasound imaging, computed tomography (CT) scans, and magnetic resonance imaging (MRI). Their treatment usually involves the removal of the Adenoma although doctors will first try to cure the condition through medication. 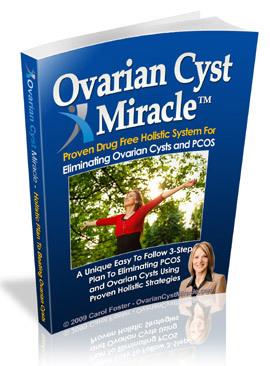 The holistic approach has become popular in recent years as a cure for many diseases including ovarian cysts. 'Holism' has been linked to maintaining good health for years now, but it has been integrated with the mainstream 'Health care System' is a recent development. The fact is, the holistic approach cures cysts in the ovary completely, and it also prevents its occurring through altered diet, healthy habits and change of lifestyle. Holistic method is not merely a technique adopted in curing a disease condition; it is an ideal concept for doing so, involving a mighty lot of factors that govern our bodily functions.